1) Can I use the equivalent of an ‘#include <stdio.h>’ (C notation) to put common parts of scripts or functions into one place? All the examples I have seen were in one stand-alone ‘.ftp’ file. 2) If not possible, can I at least make a connection script that I call from another script and use it? 3) If 2) works, could I call the three .ftp scripts from a Powershell individually (in sequence)? Or do I lose the connection as soon as the script is done? So far I am impressed. The scripting is easy and straightforward, and from what I’ve read I can combine it with Powershell via command line… The best feature is the return code check after each command during the session. Good job. 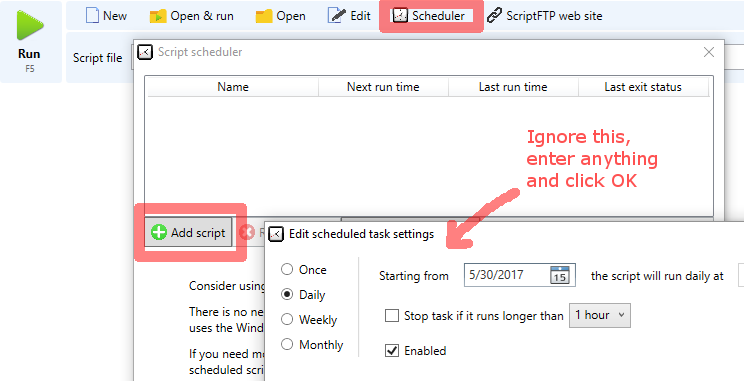 1) “Including” other script files within a script is not supported, sorry. 2) If you want to share server names, user names etc among many scripts try using GETENV (to retrieve an environment variable where you have stored the FTP server address, for example) or use GETPARAM which retrieves parameters from the command line. I hope this answer your question.